The Schools of the future have YKK AP written all over them. To provide years of dependable service, a new school must have excellence built-in from the beginning. That’s why astute architects, school officials and construction engineers are specifying architectural aluminum entrance, storefront, curtain wall, and window systems from YKK AP. YKK AP has a long track record of enhancing the exterior envelope of school buildings. Our products assure a safe, durable and comfortable environment for learning. It must foster a safe and productive learning environment. It must be aesthetically pleasing, technologically advanced, environmentally friendly and replicable on a traditional budget. It must satisfy LEED® gold certification requirements. 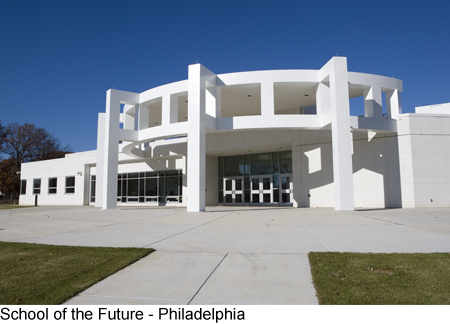 Today, the just-finished high school is a living textbook for sustainable design. The environmentally friendly building promises energy savings, increased durability and less maintenance—proving that a school of the future can be economical today. To give the school a green envelope, architects chose YKK AP® aluminum fenestration systems. YKK AP curtain walls, window walls, and sunshades met all their criteria for safety, comfort, design sustainability and life cycle savings. What distinguishes YKK AP products? Sustainable, energy-efficient products. YKK AP products are designed for low maintenance and optimum energy efficiency. For example, ThermaShade® sunshade is the industry’s only sunshade with a thermal barrier. Proprietary equipment and processes. With our vertically integrated production system, YKK AP controls every step in the manufacturing process under one roof. We make our own extrusion dies, for example, to gain optimum extrusion tolerances. Material quality control. To ensure the quality and integrity, we produce our own aluminum alloy. 10-year anodized finish warranty. YKK AP can offer an ultra-long warranty because we are the only manufacturer with an anodizing process that completely seals the surface of the aluminum. Our exclusive Anodized Plus® finish means increased resistance to chemical corrosion, superior color and gloss retention, and enhanced protection for the aluminum substrate. YKK AP® ProTek® impact-resistance systems. YKK AP pioneered the introduction of products that mitigate threats associated with hurricanes and blasts.